A couple of pieces I have been working are the adaptation of the Mindwave neural interface as a control system and Turbidity paintings. I began the research on biometry as a control interface on my Researcher-in-Residence visit at Signal Culture in December 2015. 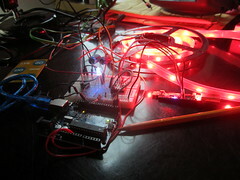 I made significant progress in the design of using different EEG readings to control simple output of lighting. The project research was covered by Brandy Allport from the Center for Research and Economic Opportunity at UWF and published by WUWF at this page. Turbidity Paintings is aa collaboration with my colleague Sara Gevurtz in underwater imaging using two open source submersible ROVs (OpenRov). The project has gotten some interest in art/science communities and hopefully i will be announcing some other exciting news soon. it has also garnered some attention by environmental science and i have a research assistant from Dr. Matt Schwartz at UWF Earth and Environmental Sciences. We began collaborative research initiative and i will be working with Haley, a production/research assistant from that department. See this post on my blog.